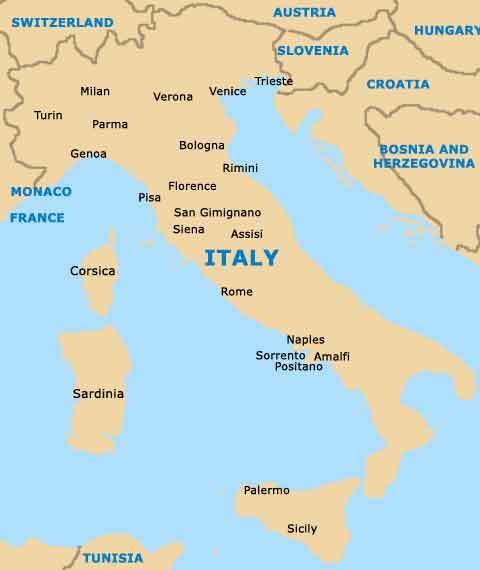 The country of Italy is situated in Southern Europe and is a long peninsula, with the Tyrrhenian Sea to the west and the Ionian Sea to the south and the Adriatic Sea to the east. Italian islands include Sardinia and Sicily. There is a wealth of accommodation in Italy to suit all travellers including budget lodging, travel lodges, bed and breakfast and luxury hotels. Places to visit in Italy include numerous historic sites, museums, landmarks, monuments, breathtaking scenery and quality shopping. The historic city of Rome is over 2,700 years old and is steeped in history. Other important cities in Italy include Bologna - a beautiful city with many points of interest; Florence - the regional capital and full of culture, history, a spectacular medieval cathedral (Duomo) and countless alluring Tuscany villas; Milan - one of the most stylish cities in Italy; Naples - the capital city of Campania, is rich in history and close to Pompeii and Herculaneum; Pisa - home to the world-famous leaning tower; and the historic city of Venice - founded over 1,500 years ago on 117 islands and famous for its canals and bridges and offering a wealth of places of interest for the traveler. Those flying into Italy may like to take advantage of the various car rental agencies at the major airports. When driving in Italy, do remember to always drive of the right-hand side of the road, overtaking on the left. Large cities such as Rome and Milan are often congested in the city centre, and so when driving in busy destinations, it is sensible to drive outside of peak commuting hours where possible. Most holidaymakers visiting the country opt for Italy travel insurance, since it gives them peace of mind for any unexpected travel-related eventualities, such as lost luggage, illness and any unfortunate accidents. Home to an enviable shoreline which remains amongst the most stunning in Europe, Amalfi is a particular coastal highlight. The town of Amalfi serves as a small, yet popular holiday resort, with a selection of sun-drenched beaches. Assisi is a very charming town and has managed to remain relatively tranquil. The birthplace of San Francesco (St. Francis), Assisi offers many quiet back streets, while its central Piazza del Comune is filled with cafes offering al fresco tables. Bologna is one of the most attractive cities in Italy and is full of character. The beautiful city centre in Bologna well preserved and maintained and is a credit to the city's policy of preservation. Florence, Italy is the capital city of the Tuscany region and is one of the country's most important and historic cities. Full of beautiful, Renaissance-style buildings, including wonderful churches and enormous palaces, Florence is steeped in culture. It is true to say that Genoa does not immediately sell itself as a top tourist destination, but when properly explored, its appeal and character soon become apparent. The Old Town area of Genoa is the perfect place for an afternoon stroll. Milan, Italy is one of the most stylish cities in Italy and is full of countless impressive buildings. The commercial metropolis of Milan is known throughout the world for its leading high fashion and design excellence. Naples is the largest city in south Italy and one of the most beautiful, particularly around the Bay of Naples. The capital city of Campania was founded by Greeks, enlarged by Romans and as a result is rich in history and architecture. Situated on the Italian island of Sicily, Palermo is to be found on the north-westerly shore and features a large natural harbour area. Palermo has bags of Mediterranean character, countless Norman buildings and some lively markets. Home to an interesting mixture of both historic architecture and verdant countryside, Parma is one of the most attractive of Italy's Emilian cities. Parma has a rich Roman heritage and is famed for its Parmigiano Reggiano cheese. Pisa, located in western Tuscany, is home to the world-famous leaning tower, but there is so much more to Pisa than this striking landmark. Pisa is crammed full of wonderful, historical monuments and heritage buildings. An attractive town situated next to the acclaimed Amalfi Coast, Positano is without question one of Italy's most stunning coastal resorts. Positano's brightly coloured cliff-side houses have become something on an iconic postcard image. Although the sandy shoreline of Rimini has long been a major tourist draw card, this Emilian city also features plenty of Italian character. With sun, sea, beaches and clubs, many visitors consider this to be the perfect place to holiday. If you were to sum up the city of Rome in two words, they would be 'busy' and'historic'. This beautiful city is over 2,700 years old and has become one of the most popular cities in the world. Rome is simply full of history. San Gimignano serves as a hilltop Tuscan delight and is crowned by innumerable medieval towers. Both the Piazza del Duomo and the Piazza della Cisterna are to be found in the heart of San Gimignano and have become central to local life. Arguably one of Italy's most beautiful destinations, the island of Sardinia is surrounded by the Mediterranean Sea and comes with some truly gorgeous beaches, including those of Alghero, Cagliari and the Costa Smeralda (Emerald Coast). The biggest island within the Mediterranean Sea, Sicily lies on the very southerly tip of Italy, where it is relatively close to the Tunisian coast of northern Africa. The Mount Etna Regional Park is a particular highlight on the island. A magical city brimming with Gothic buildings and tasty Tuscan cuisine, Siena contains a medieval centre, where many historical buildings reside. Tourists flock to Siena during the summer, when festivals take place around the Piazza del Campo. A leading Italian holiday resort with a glorious coastal situation, Sorrento manages to remain calm and appealing each summer, in spite of the influx of tourists. Tourism is widespread in Sorrento, particularly around the Piazza Tasso. The city of Trieste is to be found in the far north-easterly region of Italy, near to Slovenia and the Adriatic Sea. Trieste is a very unique Italian city and this Mediterranean resort offers a scenic coastline and some ancient Roman remains. Standing at the confluence of the Dura and Po rivers, Turin is famous the world over for its historic shroud. With a strong Baroque feel, central Turin is presided over by the Mole Antonelliana, while the Alps lie nearby and to the north. The city of Venice is simply stunning and completely unique. Founded over 1,500 years ago on 117 different islands, Venice is linked by a series of canals, bridges and many ancient pavements and the centre is divided into six quarters. The setting of the world-famous play 'Romeo and Juliet', written by none other than Shakespeare, Verona is rich in history. Attractions in Verona range from palaces around its 18th-century Piazza Bra, to a restored Roman Amphitheatre.